If you have half a brain, you probably figured out by the title of this post that we are taking the Eagles +3.5 at Carolina in the GreenZone tonight! Both of these teams played well last week, with the Birds straight flexin' on the Cardinals (34 to 7) and the Panthers beating a quality Detroit team at Ford Field (27 to 24). 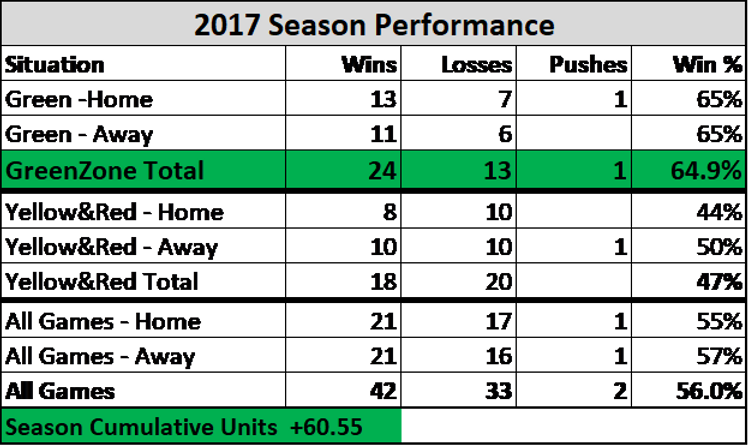 These wins continued the trend for both teams who come into the matchup sporting identical 4-1 2017 records. These teams appear pretty evenly matched on the surface and one could surmise that a 3.5 point spread for Carolina indicates they are actually slightly better than Philadelphia on a neutral field. That is where the market and us disagree. Our proprietary models have this game at about 0.5 to 1 point in favor of the Panthers which gives the Eagles about a 48% chance to win outright and a 64% chance of covering getting those 3.5 (or 3) points. That's right, we have the Eagles as a better team on a neutral field and think they have a pretty good shot at cashing on the moneyline tonight. Cam Newton looked like he was healthy for the first time all year last week against the Lions, but anyone who watched that game knows there were a handful of outrageous throws that all went his way. Even when healthy, he isn't a "dropping dimes in from the Goodyear Blimp" type QB. We like the Jim Schwartz-led Eagles D to give them all they can handle, specially given the potential return of Fletcher Cox, who is a game time decision. On the other side of the ball, this Philadelphia offense is humming. Carson Wentz is completing 71% of his passes on third down and The Big Blount is averaging 5.8ypc. We anticipate them being able to extend drives and wear down the Panthers vaunted, but becoming somewhat overrated, defense. The dual-threat abilities of Wentz put a lot of pressure on the defense with spread play-action vertical pass plays. Those bread and butter plays of the Eagles offense put a lot of stress on the safties in particular. Bad news for the Panthers who go into this matchup without starting SS, Kurt Coleman, and first safety off the bench, Demetrious Cox. This should be a pretty even matchup, but we like the Eagles to have a shot at winning and as a worst case, keep it within a field goal. E-A-G(reenZone)-L-E-S....EAGLES!